E-learning "Electrical certifications - H1(V) / H2(V) / HC"
Electrical certifications for high voltage electrical operations: worker, work supervisor, lock and tag manager. Fictis Prévention offers an e-learning solution tailored to your employees who have to perform high voltage electrical operations. 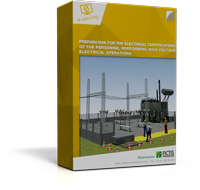 This e-learning module is intended for the personnel working on high voltage electrical structures. Prerequisite: having completed the module “Preparation for electrical certifications of the personnel performing low voltage electrical operations”. Preparing the H1, H1V, H2, H2V, HC certifications in compliance with the NF C 18-510 French norm, approved on December 21, 2011. Safely carrying out operations on electrical structures. Average duration of the training: 1h. The learner follows all the chapters and is assessed at the end of the course. At he end of the final assessment, a printable certificate is delivered.